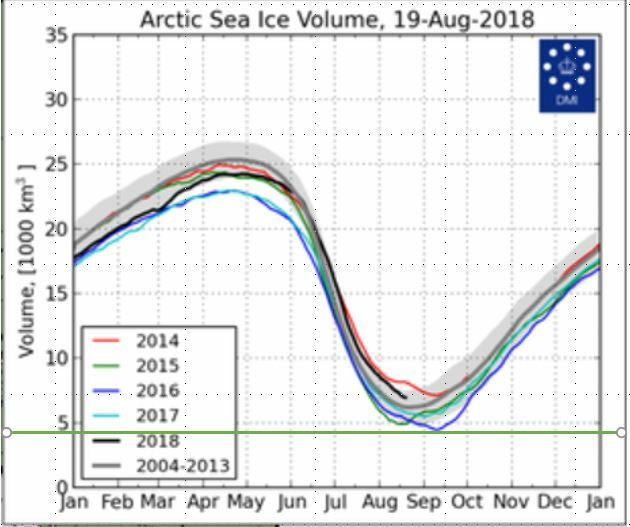 Arctic sea ice melt dropped to its lowest level since May 12 yesterday, and now the Arctic won’t be ice-free until July 20 of next year, 12:01 am. 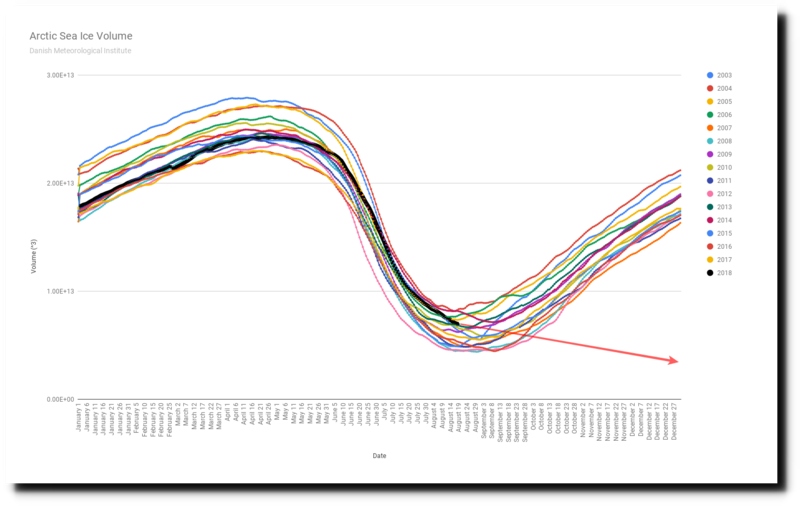 For the third day in a row, there has been almost no change in Arctic sea ice extent. I’m sad to report that the prophets have failed. 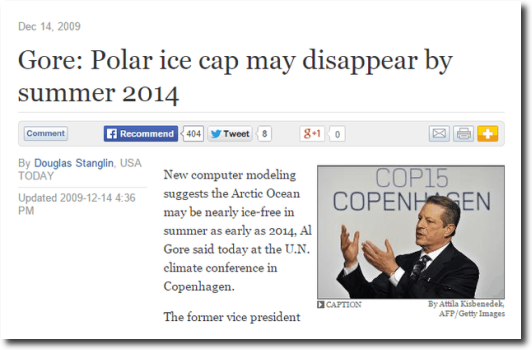 The Arctic will not be ice-free in 2014 or 2018 as they promised. Has anyone seen an Arctic sea ice Death Spiral. Can anyone here sea ice screaming ??? Where is Wadhams? Seem there will be nearly 5 of them this year !! I wonder how many multiples of the UK that is ?? 20+ at a rough estimate. Unfortunately, the RECOVERY from the peak extent in the late 1970s seems to have stalled, and with the AMO turning and the sleepy sun, will almost certainly start to reverse. Looking at several current observations in the Canadian Arctic, temperatures are near 32 degrees with snow falling in many places. Looks like summer is already over there at this very early date. Plus all of that early snow should provide excellent reflection of whatever sunlight they are getting. 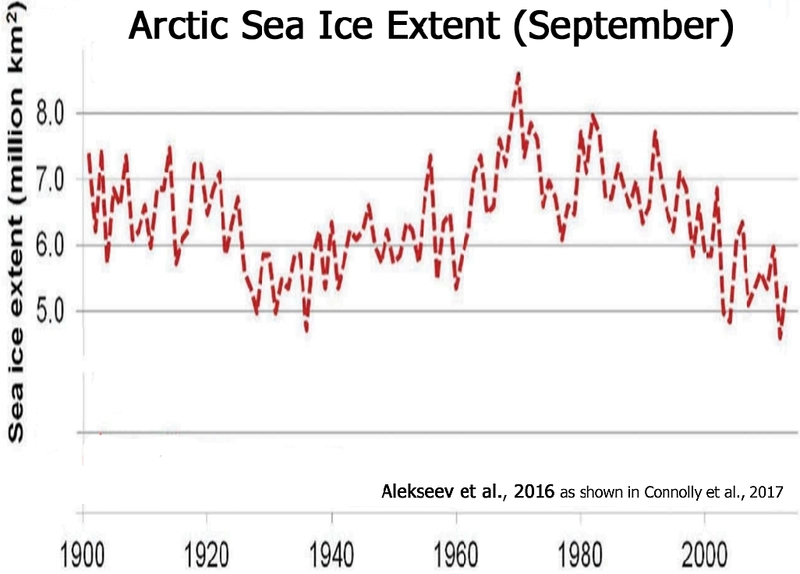 Every year a range of between 0.5 and 0.8 million cubic meters of ice survives the Arctic Summer. EVERY YEAR. Somehow the amount of multi year ice decreases. If you think about this, you realize that this multi year trend is impossible. Looking forward to all this surviving ice to magically disappear and be replaced by new “one year” ice. It appears to me to undulate; multi-year ice can grow a little, or shrink a little from year to year. But the predicted death spiral is not happening. The Great White Con Man knows this, yet he continues his propaganda campaign anyway. Please don’t summon that ghoul…. You don’t understand climate science physics. The water will resist and the ice will melt through the winter. We are dealing with tough Russian Arctic water there, not some weak New York hipster tap water. Arctic water doesn’t shudder and freeze just because it’s a little cold. The ice will be gone in no time and the Admiral will stop by to remind you of it. The published lowpoint for that year was 4.46607568605e+12. Since a cu km is 1 billion cu m, and 1000 times that is 1 trillion cu m, to interpret that number just take the e+12 off the end, and put trillion in its place, or 4 trillion, 466 billion, 75 million, 586 thousand and 600 cu m.
The lowest low in the DMI Sea Ice Volume record is Aug 29, 2008, with a lowpoint of 4.39975204557e+12. The highest low in that record is Aug 16, 2004, with a lowpoint of 8.16680547101e+12. The last couple of years Crystal Cruises were able to complete Northwest Passage trips (they turned off the webcam last year for a couple of days while they broke through ice). This year I see three ships trying to make the trip (Crystal is taking the year off). Vavilov (departed 8/12), Ocean Endeavour (departed 8/17), and Le Boreal (departed 8/18). It will be interesting to see what they do this year. I don’t buy it… The problem arises when you all try to apply homespun common sense to a field as complicated as Climate Change. Even if the sea ice plateaus over the next few weeks, all that means is that we are leaving a period of Common Melting (CM) and undergoing a period of Homeostatic Melting. And as the Sun then slips over the horizon and the line trends upward, that is simply Retrograde Melting. Yes there is a cycle as some of you have discerned, but it goes from CM to HM to RM.. and then repeats each year in the same NM-HM-RM pattern. Actually you can factor the M out to simplify to M(C-H-R) and then refer to it simply as the MChar Cycle as we do in Climate Science. 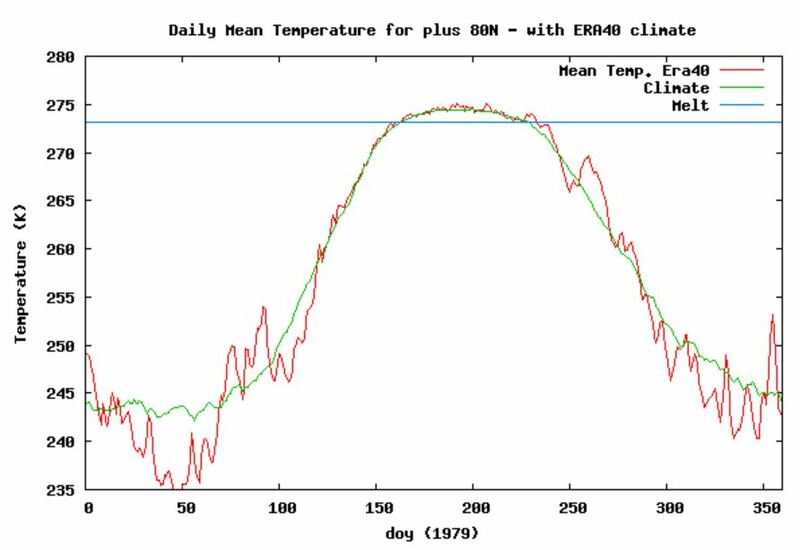 Very few people in the world are able to understand the basic science and theory (never mind concepts like the MChar or the Warming Hole) about what is happening in the Arctic, for this reason it is best left to the experts. True, but I’m afraid that all real world melting—retrograde or not—will soon be dwarfed by virtual melting. HAHAHAHA!! !… that’s some funny stuff…. hahahahaha!!! But I think it is more of an indication that I have just given up being able to understand Climate Science. As a scientist, I think I have just MENTALLY CHECKED-OUT. “Warming Ho”: Something that unexpectedly shows up at night to keep you warm. I have been in this debate for nearly 30 years, yet grow ever more optimistic because the pool of climate warming morons are getting smaller and quieter. They are slowly realizing that the many predicted dooms isn’t showing up, yes they still push the rhetorical nonsense, but they show lack of fire in their convictions. Media is now the main engine for climate disinformation and hyperbole, that later comes back to haunt them, Their stupid hyperbole mantra of the last 25 years has desensitized many to stop listening to the bullcrap, heck poll after poll shows it is at the BOTTOM of concerns, or not even show up at all. Read the feeble comments from warmist whackos there, which make clear they have no cogent rebuttal to it. They are losing and they KNOW IT by the angry replies they make in that forum thread. Anon, they are running out of steam as time goes on. It is quote a change from 10 years ago when they babbled with confidence and conviction, now they are going through the motions. Notice how Griff, Hunt and others like them often promote poor comments that don’t match with reality well. They continue to be very worried about Arctic sea ice, which is actually well above average for the Holocene, despite that it hasn’t go to zero in summer at all not even close to it, despite the many predictions that it would happen by warmists scientists, who to this day can’t admit they were comically wrong. You definitely are speaking the truth there. I was one of those CAGW morons two years ago. What woke me me up was Wikileaks publishing the Podesta Emails. I was so far in the bubble at that point, that Wikileaks shook me to the core… particularly the media silence on it. In that Cache were a few mentions of Climate Change and in particular one about Think Progress going after Roger Pielke Jr. Well, it is a long story, but as I finally peeled the onion back, due that Pielke reference, I ended up here. And also stopped teaching CAGW at University because of what I found. So congratulations about seeing through CAGW long before I did!!! Ms Griff often shows up in the middle of the night but I swear I never thought of her that way. HIS name is Ed, I know because I am a moderator at WUWT seeing the details of HIS ip background. That is why he replies during the American night a lot. Tommy, I knew about the GMT shift but this is not getting any better. I don’t want Ed to show up at night, either. They can call me what they want but I’d rather be cold. Sunsettommy – England, that makes sense. I guess it explains his posts as well, I think the law stipulates arrest for saying anything contrary to the CAGW. WUWT – That is a great website. Keep up the good work! I have not commented there, only so many hours in the day, and I found RCS first. It seems like such a large community over there as well. I’d like to remind sunsettommy that under EU law it is illegal to reveal details of someone – anyone – has entered into a website. If you think calling you Ed, is in any way a “detail”, you are even more of an idiot that even I thought you were. Its been known for ages. You have told others more info about yourself just by your comments. 1. you are an ignorant moron, incapable of learning even the most rudimentary facts..
2, Somewhere in the UK, probably a snotty dark far-left London suburb. 3. Semi employed, by someone who is very generous to the mentally handicapped. Ms Griff, is it illegal under EU law to republish details found elsewhere on the internet? Do you realize using anonymous name is not a legal name, but most people do it anyway. My first name is THOMAS, who lives in the Pacific Northwest America. Thanks for the heads up Tommy! Jimbo rejoices in his role as a mindless fetid troll. How much more PATHETIC and SLIMY can he get. !! Much more. Don’t underestimate the depth of his fetishism and self-love. I have seen the comments you posted there that were indeed trolling and violation of site policy, you have been warned several times before he finally banned you. By the way Jim, I know who that malicious troll is who got nailed by Anthony Watts, as this fella is a regular commenter at YOUR blog. I have seen YOU asking him to stop the name calling, which means you are not so fond of his behavior on YOUR blog. I can guess exactly which experts he has in mind, and who is to judge their competence. I prefer to be guided by Tony’s quote by Feynman: “Science is the belief in the ignorance of the experts.” I suspect, just maybe, that R. P. had a better grasp on science than Anon. These melting ideas aren’t that difficult to understand for anyone interested, so I don’t know who Anon is hanging out with, or what their capacities are. Anyway, to make this snow job even more obtuse, I’ve taken the liberty of translating the terms into Russian. So we now have Обычное Плавление, Гомеостатическая Плавление, Ретроградное Плавление, and П(О-Г-Р), which we may now abbreviate to П-ОГУРЕЦ. I bet even fewer people are able to understand them NOW! Since I used the word, and unlike Anon feel some obligation to explain myself clearly, огурец means cucumber. In Italian, cucumber is cetriolo, a word my boyhood friends would use to describe someone especially thickheaded; it seems especially appropriate here. Multi year ice is difficult to understand. 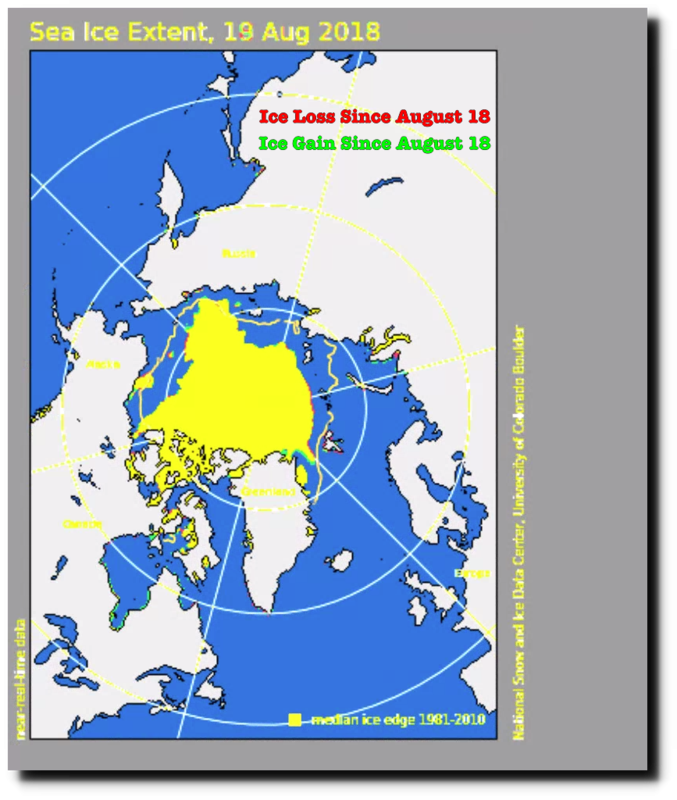 In late September all the ice left becomes multi year ice so 100%, composed of now 2,3 4 and aliitle bit of 5 year or more. Yet the percentages we are given must be from the end of the freezing spell? Hence any sort of decent recovery must give a reduced percentage of multi year ice initially. Unless related back somehow to the long term average. It is truly sad that despite the growing number of failed predictions of gloom, far too many people still believe the lies they have been fed and taught. Unless we either wrest control of education from those who wish to teach lies, or come up with a way to totally bypass them, the number of those misled will continue to rise. Thanks Tony for your efforts. and extent still hovering around 5th lowest. 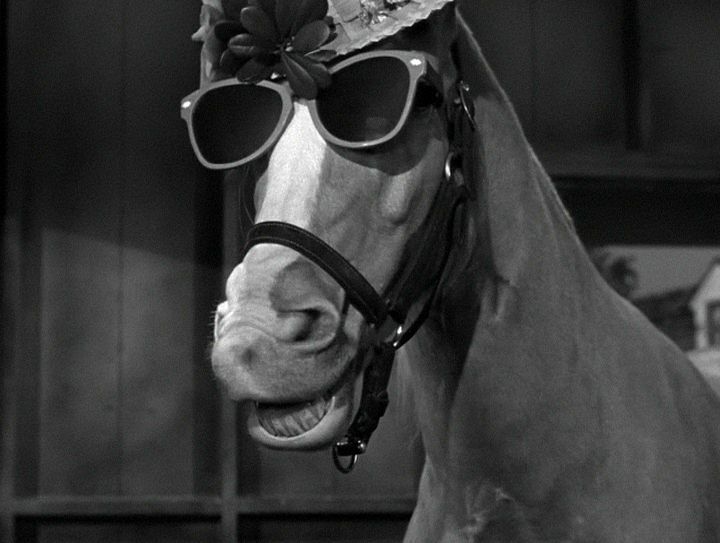 Sorry Griff you are only 2nd best today… Study a better joke above. Neither Griff nor one of his many clones here has ever bothered to respond to any of the above. And now he has the temerity to play DISHONESTY CARD, ufb! If you are all wondering how Trump ever got elected President, you need look no further than the HYPOCRISY of Griff. And the more he talks, the more likely Trump will have a second term. The nation suddenly WOKE UP. Sorry Ms Griff, But Dr Lindzen is actually a climate expert. That is a rather childish taunt. It is customary among adults to bring up specific points and to articulate where and how you differ. If you descend to the level of taunting you’ll likely be shredded at this site. It’s more dignified to be shredded on more intellectual level, which is what would occur if you had a discussion with Lidzen. What you seem to attempt is to taunt when dealing with intellectuals, but to become all intellectual when dealing with people prone to taunting. All this proves is that you are not very good at either. Jimbo showed us yesterday just how accurate DMI is. You wouldn’t to argue with Jimbo, your comrade non-entity, would you griff. !! If the ice would only melt then Vlad could get the oil and get the old USSR back together and institute world socialism and solve the problem of global warming. See how that works, Griff. Fifth lowest only if you cherry pick the past 39 years. But even then, there are four lower years in a very short and cherry picked period. So what is your point again? Are we not starving poor brown people to death in great enough numbers for your liking? I am stunningly amazed at the hyperventilation that goes on about the Arctic. Funny as can be. Although, I have to admit, the “Death of the Arctic” story is getting really really old. I simply do not care one whit .. it matters not. Only the agenda driven leftists actually care. A recent poll asked Americans what their greatest concerns are, and not one of the respondent even mentioned climate change. Without the gathering abilities of the internet, which makes fringe elements look like large movements, this whole charade would be over already. But a global push for communism has been possible thanks to the many Potemkin villages and village idiots produced by power hungry governments. 5th lowest in a 40 year set of comparable data, yes… long enough to show climate over weather. and there is plenty of evidence of the ice state going back into the 1890s and guess what? The lowest in the 40 year satellite sequence are the lowest in that whole period… lower than the 1940s. And still nothing new except the alarmist genocide. Why do you hate poor brown people and Griff? Get back to us when a small boat sails through the Prince of Wales Strait without an icebreaker assist, like Larson did in 1944. Latest sea ice reconstructions match temperature quite well griff. Or are you going to continue DENYING the facts.? 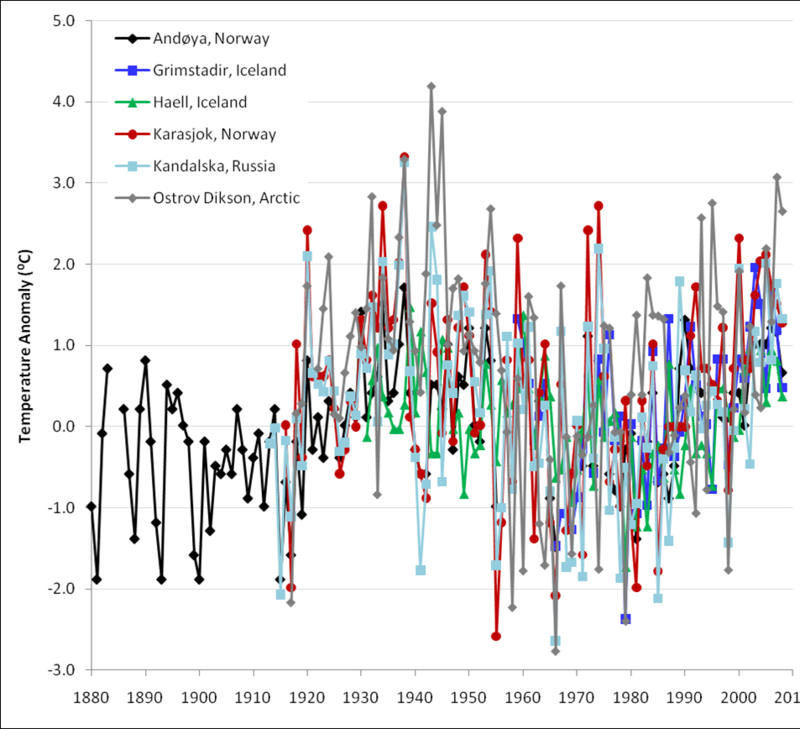 And of course, the whole 40 years has been just a RECOVERY from the HIGHEST EXTENT since the Little Ice Age. The first 9500 or so years of the Holocene had LESS Arctic sea ice than now. Why are you continuing to DENY climate change, griff. Why do you continue to DENY that the planet is only a small amount above the COLDEST period in 10,000 years? #5 2018 volume declined 21 cu km (8 cu km less than the 16-year average for the date,) so the percentages rose to 111.96% of the 16-year average, and to 111.58% of the 10-year average. Nope, same story. Nothing new in the Arctic. PIOMESS is an agenda driven model. Hey griff, its mid/late August now, why post a graph from mid July? As of right now (August 20), when arctic temperatures should normally start going below freezing again, it’s still above freezing. You mean like in 1979? Yeah, you hang on to that one. Mr. Sir, is that all you have? 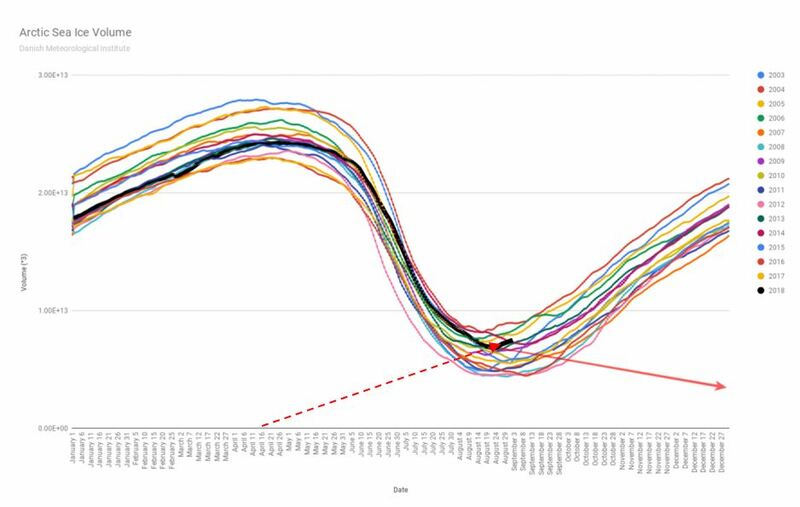 The Arctic is so close to 273.15 K (=0C) you’re picking the skin of them cherries. This plot of air temperature reflects what the ice/water surface is doing to the air, not what the air is is doing to the ice. Since nearly all heat transfer is between radiation and the surface, the surface temperature more determines the air temperature than the other way around. In the summer, incoming solar radiation exceeds infrared surface heat loss, so the surface warms until ice starts to melt. The surface can’t get above the melting point of ice, and the air won’t get more than a few degrees above freezing until the summer ends, or the ice totally melts, whichever comes first ;-). As fall approaches, the sun hits at progressively shallower angles, outgoing infrared from the still-warm surface continues to throw off heat, so the surface cools and brings down the air temp with it. This time, there’s nothing limiting how cold frozen ice can get, so the temperature plummets many tens of C.
Bottom line: air temperature is more of an indicator of surface temp than an source of heat transfer. For the current discussion, the main point is that the surface right now is cooling the air which is at freezing, so the surface must be a few degrees cooler yet. Freezing is already happening, as the ship report indicates. The day-to-day wild card is cloud cover since it affects both incoming and outgoing radiation. This depends on how much water vapor (absorbs radiation) there is compared to water droplets (reflect radiation). I’ve no idea if it’s possible to show this cloud balance on a map; maybe someone here knows a site that does. in particular take note of the volume chart – much more realistic than DMI model. This is not a first time, or a record. Gator, Ms Griff revealed to us that she hates poor brown people but you must stop repeating it. Under EU law it’s illegal to reveal details that someone—anyone—has entered into a website. Then why is Ms Griff here everyday, revealing herself to us, doesn’t she know she is breaking the law? Does her hatred of poor brown people outweigh her fear of imprisonment? There is NO science coming from there, griff. You make a FOOL of yourself every time you post. PIOMAS gridded thickness was updated (last day 15 August). Computed volume is about 6.19 [1000 km3], sixth lowest behind 2010-2012, 2016, and 2017. and nearly 7th lowest out of last 17 so in the middle really of recent . 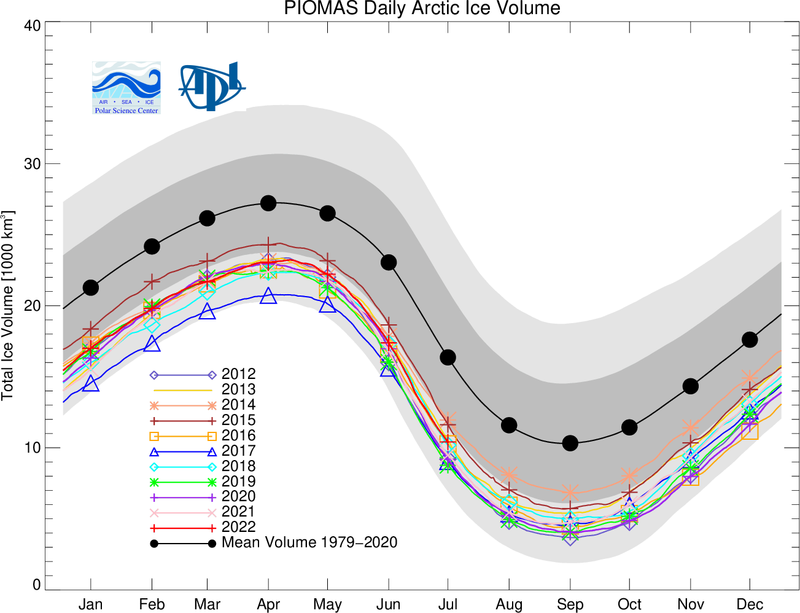 Could be a really good recovery by November, but ice is a bit unpredictable. You have it all wrong! The Guardian says so! go look at the scientific observations reported, the original science, then base your objections on that. clearly ice has gone from the north Greenland coast and clearly the Lincoln Sea ice has broken up – that was where the thickest ice used to be. No wonder you are so, so DESPERATE. DARN, THERE”S A LOT OF SEA ICE UP THERE.!!! Thanks for showing us how accurate DMI is. Still LARGE AMOUNTS of thick sea ice up there griff. Huh? I thought the thickest ice was over Detroit. Gruniad are monumental LIARS, and publish GARBAGE, twisting non-facts to suit their far-left agenda. If possible they are even more DISHONEST than you are, griff. WOW, about time too. !!! Later than the last few years. How about the Larsen Route from 1944, is that open yet , griff? You do know that the Arctic sea ice level is in something like 9500th to 9600th LOWEST place out of the last 10,000 years, don’t you griff? Or are you going to continue your WILFULLY DUMB Climate Change Denial. Too much for you to figure out ????? And look at all that orange that changes into multi-year sea ice really soon. So what? 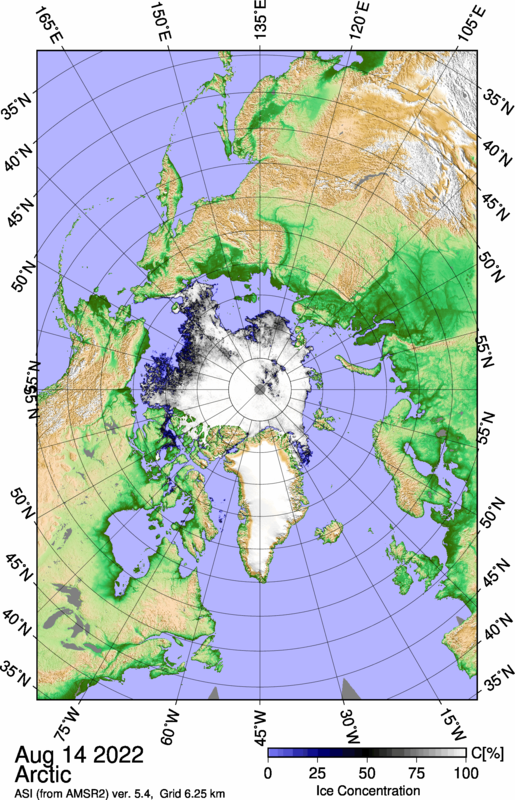 There is still more ice in the Arctic than the average of the past 9000 years.